Father Mario Bellini initially taught at the Istituto Superiore die Desegno Industriale in Venice before taking up a post as adviser to Olivetti. In 1973 Mario Bellini established the architecture and design bureau "Studio Bellini" in Milan. In 1987 the Museum of Modern Art in New York presented a retrospective of his work. Since 1995 Mario Bellini teaches at the University in Turin, as well as leading courses and classes worldwide. Son Claudio joined his father’s Studio in 1996 and since then the pair have produced range of classic-styled furniture. 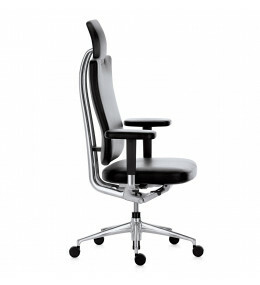 Headline executive office seating is a supportive high-end ergonomic management chair solution.